Alright, Kia. Sit down. We need to talk. Sure, you’re just getting into the groove of this “cool cars” thing. That’s fine, understandable. But if there’s one thing you don’t do in this realm of “coolness,” it’s tease a beautiful shooting brake and casually mention that hey, you know, it’s probably not coming to America. Because we know how this is going to go down, it’s probably better to keep it short for the folks in the ol’ Red, White and Blue. Kia announced Wednesday that it’ll bring a new concept car to the Frankfurt Motor Show next month, and that the car “indicates what the next-generation Cee’d could look like.” The Kia Cee’d is made for the European market. That probably won’t change. But you know how concept cars are. The production version almost never turns out as cool, which is a bit of relief for the small population of jealous Americans who will probably never get to own one. The press release said the concept is a “new body type” for Kia—an “extended hot hatch.” That’s a wagon, or a “shooting brake” if you’re feeling fancy and like to talk in a niche way. 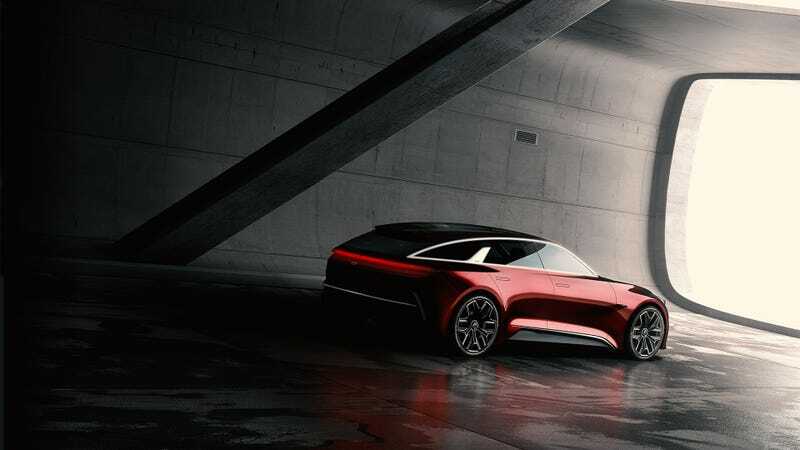 But none of that likely matters if you’re in the U.S., because Kia didn’t mention anything about this concept car taking on a form other than the Cee’d. Even if the car did make it to America, it’d probably be lifted and covered in black plastic. That’s what people over here buy, which means we miss out on all of the good stuff. America: The land of the lifted cars and the home of the cheap plastic. It’s about time we get out of here, y’all.